I am grateful to the feedback on my previous post, whether it has been in public or in private. I think of the V-Dem data as an important contribution to how social scientists can measure institutions, and democracy in particular. I do, however, have some thoughts on the V-Dem data and the main other datasets on the same topic as well. This entry was posted in institutions, turkey on October 6, 2016 by Erik. Earlier this year, the University of Gothenburg’s V-Dem institute released a new database on democracy. As it turns out, this database yields some new insights on the timing of Turkey’s democratic erosion, a topic I’ve previously covered (here, here, here, here, here, and here). Frankly, as a political economist (and all-out data nerd, for that matter) I have trouble expressing how exciting this is. 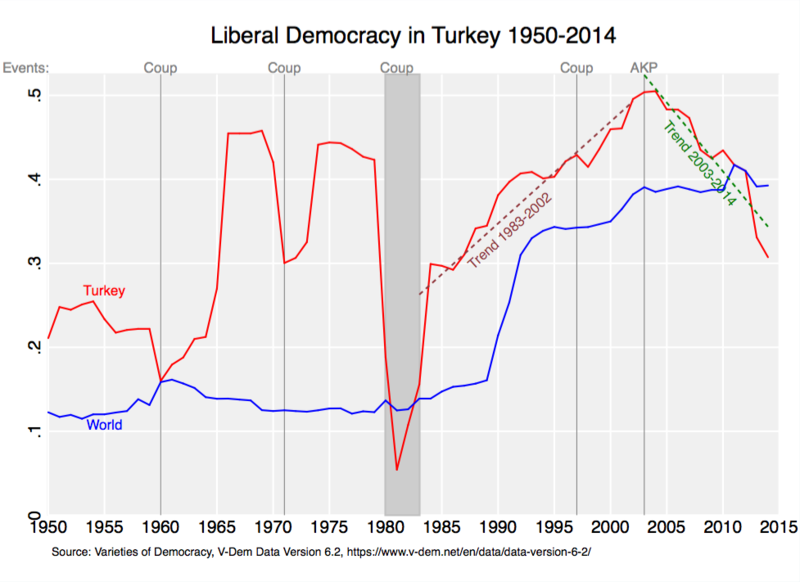 Of particular interest is the measure of liberal democracy, a topic of significant focus both globally (here, here) and specifically for Turkey (see here and here), but I’ll show graphs for the other main components of the V-Dem data as well. This entry was posted in institutions, turkey on October 4, 2016 by Erik. In the last post, I found that several Freedom House measures of basic freedoms have been deteriorating in Turkey for a long time, especially when it comes to freedom of expression. Freedom House (hereby FH) also publishes specific measures of freedoms of the press (data available here), a component of the freedom of expression & beliefs score used previously. Similar to the Freedom of the World publication, FH use subscores to calculate aggregate press freedom scores that are then divided into three statuses, Not Free, Partly Free, and Free. And like the Freedom of the World status, Turkey’s press freedom status has been constant at Partly Free since 2005, only becoming Not Free in 2013 and thereafter. A political environment category, evaluating the degree of political control over the content of news media including editorial independence, access to information and sources; official censorship and self-censorship etc. An economic environment category. This includes the structure of media ownership; transparency and concentration of ownership; the costs of establishing media as well as any impediments to news production and distribution; the selective withholding of advertising or subsidies by the state or other actors; the impact of corruption and bribery on content; and the extent to which the economic situation in a country impacts the development and sustainability of the media. In the below graph I show the combined press freedom score for Turkey, as well as its subscores for the legal, political, and economic environments. For the sake of brevity here, the focus is on percentile ranks and Turkey’s performance relative to the world distribution, with higher percentiles implying more freedoms. The above graph shows a total Freedom of the Press score for Turkey that is stagnant up until 2009 and then starts to slide downwards. The legal environment subscore has been falling consistently since 2005 when it began around the 40th percentile. (This matches the timing of changes to the Turkish penal code, which according to analysts, made prosecuting journalists easier. (See for example here) In 2014, it had fallen to the 16th percentile, an absolutely abysmal deterioration. The political environment subscore was rising somewhat until 2008, and has been decreasing afterwards, from around hovering around the median country in the world to the 22nd percentile. The economic environment subscore has remained largely constant up until 2012, followed by a smaller, but not insignificant, ten-percentile drop. This entry was posted in institutions, turkey on March 23, 2016 by Erik. Accepting this narrative is a convenient exit for analysts who have overestimated the degree to which Turkey’s democracy was improving during the last decade. They weren’t wrong then – instead it is Erdoğan who has recently taken an authoritarian turn. For the Gülenists and a number of established journalists in Turkey, who are among the lead protagonists in pushing these talking points, this narrative provides moral amnesty for their alliance with the AKP up until the two groups fell out over differences on policy and the allocation of power within the security establishment. It also provides cover for their past cheerleading of witch hunts against critical voices in the past (see here and here). However, using standard measures of freedoms like those of Freedom House (hereby FH) suggest a different picture. In particular, Turkey was backtracking especially in freedoms of expression as well as political pluralism long before the corruption scandals of 2013, and these losses preceding 2013 often dwarf those occurring afterwards (at least so far). This entry was posted in institutions, turkey on March 17, 2016 by Erik. Which country has the most illiberal democracy in the world? Economists Dani Rodrik and Sharun Mukhand further point out the relative scarceness of liberal democracies around the world. In November 2014, Joseph Stiglitz told an audience at the Central European University that “[t]he conscious development of a learning society, essential for shared prosperity, can only be achieved in a liberal democracy”. This entry was posted in institutions, turkey on June 18, 2015 by Erik. Many were taken by surprise by the announcement of the Kurdish HDP’s to run as a party in the upcoming 2014 elections, as opposed to running as independent candidates, which it has done until now. Running as independent have been the Kurdish political movement in Turkey’s way of circumventing the draconian ten percent threshold, which excludes parties from representation in the Turkish parliament if it fails to win more than tern percent of the national vote share. The HDP candidate Selahattin Demirtas did receive nearly 10 percent of the vote in the last (presidential) elections, but given it’s 2011 vote share of ~7 percent, and opinion polls putting HDP at roughly 6-8 percent, it seems a rather tall order to expect HDP to pass the ten percent threshold needed for any parliamentary representation. Most likely it will fall below that, and if it has then run as a party, it will not receive any votes at all. These votes will then almost surely fall into the hands of the ruling AKP, likely giving it the supermajority needed to rewrite the constitution. In this case, the Kurds are dependent on the AKP to use its borrowed Kurdish votes to run through the institutional changes needed to accommodate Kurdish preferences. Failure to do so could result in another lost opportunity for Kurds to achieve institutional equality in Turkey. As such, the HDP strategy is quite a gamble. Several people more qualified than me have now written about this (see for example, recent articles by Amberin Zaman’s in Al-Monitor, as well as Gareth Jenkins in The Turkey Analyst). This entry was posted in institutions, turkey on February 5, 2015 by Erik. With Erdoğan’s victory in yesterday’s first round of the presidential elections, Turkey appears set for (at least) another five years of his rule. Whereas as Prime Minister, his powers were substantial (if not unprecedented in post-war Turkey), as President he will for now be holding a much more ceremonial post. As a result, further institutional change is likely to be expected, as will be an attempt to reform Turkey’s political system into one with a much more powerful presidency. In doing so, we can expect attempts for a substantial institutional overhaul. There are many problems with Turkey’s current institutions, and so reform is much needed. But whether new reform will lead Turkey towards more or less democracy is far from certain. What is more certain, however, is that Erdoğan will continue to rely on economic growth as a motor for his own popularity, and any institutional change will likely be infused with this. Another possibility is that Erdoğan and his team don’t care much for economics and instead start coming up with their own methods. With Hungarian’s PM Orban’s recent proclamation that ““liberal democratic states can’t remain globally competitive,” and instead looking to “illiberal state(s)” like Russia and Turkey as a role models, one would wonder who Erdogan thinks of as a role model at present. Given the weight Erdoğan puts on economic growth, for this purpose I made a graph of a number of selected countries and country groups’ GDP per capita path over the last two decades. 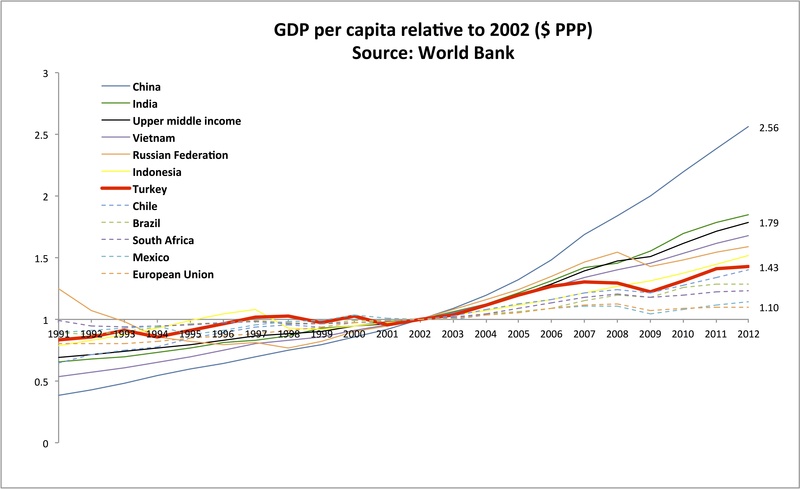 It shows Turkey somewhere in the middle of the sample’s performance, increasing its GDP per capita since 2002 by 43 percent. A noteworthy aspect is the ranking (given in the legend of the graph) which suggests many of the more authoritarian countries like China, Russia and Vietnam belong to those who have outperformed Turkey in economic terms, whereas many of the more democratic countries – both among emerging markets as well as the EU – have underperformed relative to Turkey. A concern is that, like Orban, Erdoğan may end up looking towards China, Russia, and Vietnam as role models, not just because they offer authoritarianism per se but because they make up fast-growing authoritarian governments. His beliefs on whether a link between authoritarianism and economic development exists may very well end up determining Turkey’s institutional future. This entry was posted in institutions, turkey on August 11, 2014 by Erik.